And surprise, surprise, it's not just salads. 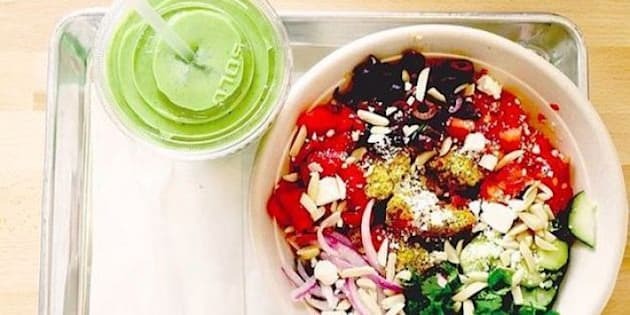 If you're used to making your own meals at Freshii, you may be forgetting to look at the chain's actual menu. The Canadian-based Freshii, known for its salads, bowls and wraps filled with fresh ingredients (either as suggested by the chain or customized for your own tastes), still has plenty of items that can be filled with sodium and fat if you overindulge in the wrong items. For the most part, like any healthy food joint, most of the sodium can be found in dressings and sauces. Just from a quick glace, the Buffalo, Fiery BBQ, Terikyaki and Sriracha sauces have over 1,000 mgs of sodium. If you want to cut back on sodium, order your salad with olive oil or lemon juice or get your sauces on the side. "This chain is a great example for people to realize than even at a healthy fast food chain, nutrition information needs to be looked at," says registered dietitian Anar Allidina. "A salad still contains calories, fat and sodium and toppings such as cheese, nuts and dried fruit really add up." For lunch, Allidina suggests aiming for 500 calories, five grams of saturated fat and less than 800 grams of sodium. This week our dietitians picked burritos, wraps, salads and breakfast items they would eat at Freshii. Check out the slideshow below and let us know, what do you order?